1. What were the names of Cumberland's Taverns and Saloons? Where were they located? Some of the most well-known taverns were Shipley's on North Mechanic Street, James Black's Tavern on South Mechanic Street, and Samuel Slicer's at Baltimore and Mechanic Streets. The United States Hotel at the northwest corner of Baltimore and North George Streets was built before 1850 and was a tavern and stage station. As the years passed and with the coming of the railroad and the C&O Canal, many of these taverns were becoming known as saloons. As the city grew, so did the number of saloons. 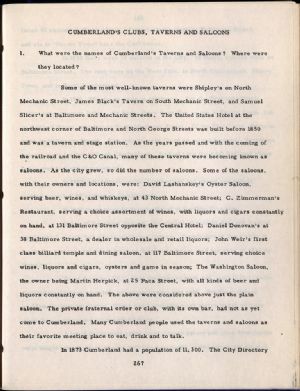 Some of the saloons, with their owners and locations, were: David Lashanskey's Oyster Saloon, serving beer, wines, and whiskeys, at 43 North Mechanic Street; C. Zimmerman's Restaurant, serving a choice assortment of wines, with liquors and cigars constantly on hand, at 131 Baltimore Street opposite the Central Hotel; Daniel Donovan's at 38 Baltimore Street, a dealer in wholesale and retail liquors; John Weir's first class billiard temple and dining saloon, at 117 Baltimore Street, serving choice wines, liquors and cigars, oysters and game in season; The Washington Saloon, the owner being Martin Herpick, at 25 Paca Street, with all kinds of beer and liquors constantly on hand. The above were considered above just the plain saloon. The private fraternal order or club, with its own bar, had not as yet come to Cumberland. Many Cumberland people used the taverns and saloons as their favorite meeting place to eat, drink and to talk.